Virtually every digital storage oscilloscope has math functionality. This goes beyond the instrument’s ability to measure, quantify and display the many waveform parameters of a signal at the input, although those properties are important too. We’ll take them one at a time. Dual Waveform Math, as its name suggests, requires two signals at the input. To access this fascinating function, power up the instrument and press Math. The menu appears at the bottom of the display. Press the soft key associated with Dual Waveform Math. For one of the two required waveforms, we have connected the internal AFG, outputting a 60-Hz sine wave with 5-V peak-to-peak voltage, to analog input channel one. For the other required waveform, we have connected a 9-V dc battery. The ac waveform is in yellow, the dedicated color for channel one. The dc waveform is blue, the dedicated color for channel two. The sum, difference, product and quotient for each of the operators is in red, which is not one of the dedicated analog input channel colors. For a tour of this dual waveform math function, using the soft key that is associated with the operator, cycle through the arithmetic operators: add, subtract, multiply and divide. From the top to the bottom image, add, subtract, multiply, and divide. Now, as a further exercise that will demonstrate some other math relations, reverse the polarity of the battery that is connected to the probe at the channel two analog input. Before the dual waveform operation takes place, the first and second sources are chosen by selecting the desired channels, using multipurpose knobs a and b. In addition, these same knobs can set one of the available reference waveforms, R1 – R4 as first and second sources. So it is actually possible to perform a math operation on a signal or pair of signals that exist only in the oscilloscope memory. To see this operation, press the Reference button, which is directly below the Math button. The Reference Menu appears across the bottom of the display. It consists of R1 – R4, with the date and time when each reference waveform was created and, by default, a notation that the reference signal is off. Pressing the associated soft key with, let us say, R1; that reference waveform toggles on and appears in the display along with the other dual waveform signal that has been entered and with the resultant, each in the dedicated color. (The analog channel inputs are yellow, blue, purple and green. The math resultant is red. The reference waveform is white. This color coding makes it easy to see what is going on.) Notice also that the buttons for Math, Reference, AFG and whatever analog input channels are active are all lighted. This is in contrast to the radio frequency button, RF, which when pressed toggles off Math, Reference and any analog input channels. AFG, however, remains active. The point is that in the oscilloscope some functions can co-exist while others are mutually exclusive. Seeing these relationships goes a long way in understanding the architecture of a digital storage oscilloscope and then becoming adept at signal acquisition and display. After Dual Waveform Math, the next item in the Math menu is FFT. These three innocuous sounding letters stand for fast Fourier transform. That is a set of algorithms permitting theoreticians, technicians and others to move from the time domain to a frequency domain view of any waveform of finite bandwidth. The theoretical basis for this, as stated in Joseph Fourier’s Analytic Theory of Heat (1822), is that any periodic function, regardless of its complexity, can be decomposed into the sum of a finite number of sine waves. It is possible to go back and forth between these two domains in processes known as analysis and synthesis any number of times with no loss of information. The advantage of the time domain representation as seen in an oscilloscope display is that it gives us a simple intuitive view of a complex waveform, while the frequency domain view reveals the location within the spectrum and a relative as well as an absolute measure of the ampacity in power of each constituent sine function. In a mixed-domain oscilloscope, time domain and frequency domain appear together in whole-screen format. Rather than two inputs, as required in Dual Waveform Math, a single signal connected to an analog input channel is displayed in both domains when FFT is invoked. The user has only to press FFT to access this interesting oscilloscope mode. Time and frequency domain sine wave displays. All the electrical energy appears at a single frequency. Time and frequency domain square wave displays. The electrical energy appears throughout the spectrum, diminishing at greater distance from the fundamental. 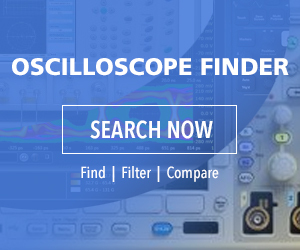 Oscilloscope frequency domain displays can be matched to known system frequencies such as from system clocks, oscillators and power supplies. This technique is useful in isolating faults caused by mismatched impedance, RF interference, problematic cooling resulting from less than optimum component placement, and the like. Using the FFT-based frequency domain mode, the utility power supply can be examined for harmful harmonic content, the dc bus in a variable frequency drive can be checked, and the VFD output to a motor can be evaluated. Another important application is monitoring a broadcast transmitter to ensure that the output is FCC compliant. Each of the windows has special qualities which make it better for specific frequency domain displays and measurements. The rectangular (also called boxcar) window has excellent frequency resolution but its amplitude accuracy is poor. It is at its best in measuring transients and bursts where the signal levels are nearly equal before and after the event. The Hamming window has good frequency resolution and moderate spectral leakage, with fair amplitude accuracy. It is used to look at sine, periodic and narrow-band spectral noise. It is most suitable for bursts and transients where the signal levels before and after the event are significantly different. The Hanning window has good frequency resolution, low spectral leakage, and fair amplitude accuracy. It is also used on transients and bursts where signal levels before and after the event are significantly different. The Blackman-Harris window has poor frequency resolution, low spectral leakage, and good amplitude accuracy. It is used predominantly to measure single-frequency waveforms to detect higher order harmonics, and to examine several moderately or widely spaced sinusoidal signals. Advanced Math lets users create custom math waveform expressions that incorporate active and reference waveforms, measurements and numeric constants. To access the mode, press Math and in the menu, press the soft key that corresponds to Advanced Math. Then, use the side menu to create custom expressions. Press Edit Expression and use the Multipurpose knobs and resulting menu buttons to create an expression. When done, press OK accept. For example, Edit Expression can be used to take the integral of a waveform. To do this, press Clear on the lower menu. Turn Multipurpose Knob a to select Integrate. Press Enter Selection. Turn Multipurpose Knob a to select the channel. Press Enter Selection. Select, again using Multipurpose Knob a. Press OK Accept. The signal is integrated, calculating the product of amplitude and time, the area under a curved line generated within Cartesian coordinates.